Do you like potato chips? Perhaps you have a soft spot for the salty snacks. There’s nothing wrong with liking a salty treat every now and then. Heck, we all like to indulge sometimes. But, what if you are a potato? Does that make it wrong to snack on salty potato chips? The jury’s still out on that one. We tend to think that snacks are a matter of personal taste and that it shouldn’t matter if you are a potato or not - snacks are free game. 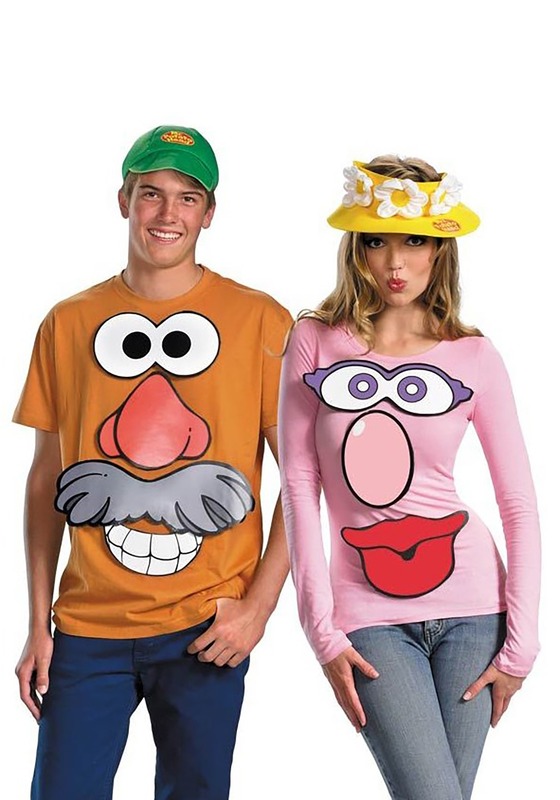 So, dress us up as a potato, give us a big bag of potato chips, and don’t run off and tell the kids! Create a quick and inexpensive couples costume with this Mr. and Mrs. Potato head kit! The set includes a Mr. Potato Head hat, Mrs. Potato Head hat, and two eye stickers, two nose stickers, a teeth sticker, lips sticker, and a mustache sticker. The self-adhesive felt stickers have a peel-off backing for easy use. Mr. Potato head has a green polyfoam baseball cap while Mrs. Potato Head has a yellow polyfoam visor with white fabric flowers. Use them to decorate a plain T-shirt to create your own funny Halloween costume. Whether you want to get a laugh this Halloween or need to dress up for a theme party, this easy costume is the perfect choice for getting ready in a hurry.